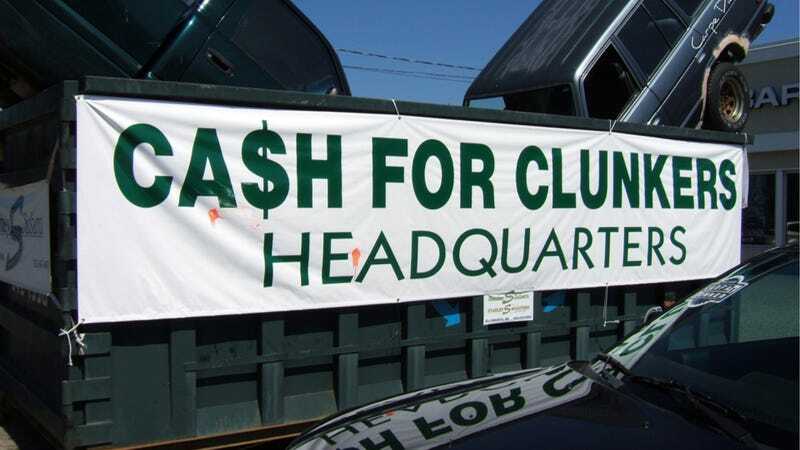 Remember "Cash for Clunkers," that program implemented in 2009 where the federal government was giving people money to buy shiny, fuel-efficient new cars if they traded in their old gas-guzzling clunkers? It was supposed to be a win-win situation for both the environment and America's struggling economy. But one group says that it definitely wasn't good on the environmental count. Why? Because the cars traded in weren't recycled, according a recent story in E Magazine. See, while people were trading in cars that were older and less fuel efficient than modern ones, many of them were perfectly functioning with good engines. According to the Automotive Recyclers Association (ARA), almost 100% of a vehicle can be recycled. Even the fluids can be reused, according to the ARA. Transmission and brake fluids, anti-freeze, oil, gasoline, diesel and Freon from air conditioners are harvested at scrap yards for use in other vehicles. However, still-functioning engines are the most valuable part of a scrapped car. The engine itself takes the most amount of energy and resources to manufacture, so car companies reap both an environmental and cost benefit from being able to recycle engine parts. ...recycling just the plastic and metal would represent 24 million barrels of oil saved each year. Unfortunately, that did not happen with the 690,000 vehicles scrapped during the Cash for Clunkers program. There's a lot more to a car's impact on the environment than fuel economy and carbon emissions. People never seem to take the production (and destruction) process into account. While Cash for Clunkers may have put a lot of people into fancy newer cars, it's hard to see the benefit to anyone in the long run.